Red Bull Honda World Superbike Team’s Nicky Hayden and Stefan Bradl have completed the official two-day test at Phillip Island, and they are now only three days away from the start of the opening round of the 2017 FIM Superbike World Championship, which takes place at the same venue from Friday. 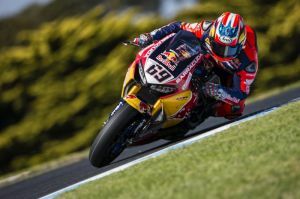 After a weather-affected opening day of action at the spectacular 4.445km Australian track, the riders enjoyed much better conditions today as they continued to work with the crews on their brand-new Honda CBR1000RR Fireblade SP2 machines. Both Hayden and Bradl have completed a good number of laps today and tried different settings on many areas of the bike, which have given the team a considerable amount of information to work on ahead of the first free practice session of the year, scheduled at 9:45am local time (GMT +11) on Friday.